2 While JustGiving's fee structure is straightforward, the actual amount they charge depends on which payment methods were used to make the individual donations (credit card, debit card or PayPal) and how much money each charity raises through the site. 4 As we reported in February 2013, Alison's fabulous friend Claire wanted to do her bit for TEAM!. She went on to trounce Bath Half Marathon in a tremendous 01:55:52 and in doing so raised a fantastic £260.43. Her fundraising was not included in the Diabetes UK VLM total, but it is in ours! Our heartfelt thanks to every one who donated money to TEAM!, your generosity has been utterly astounding and sincerely humbling. Fundraising has now finished and the summary above shows the times run and the final totals raised for Diabetes UK in memory of Emily. 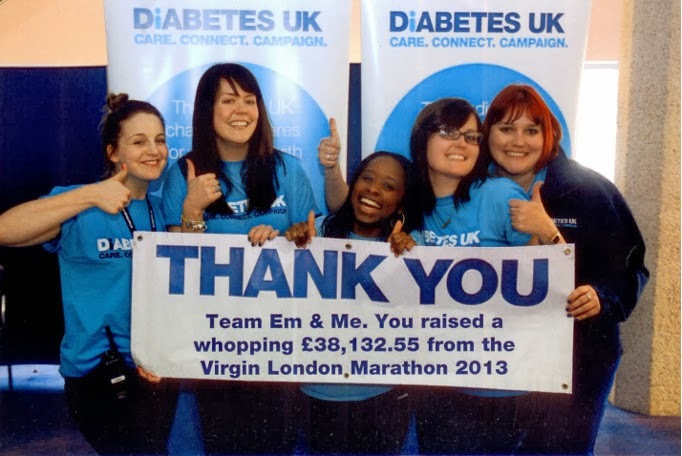 Finally, here is a fab picture courtesy of the VLM Team at Diabetes UK. N.B. For some archaic legal reason, their official total is not allowed to include gift aid! Copyright Iain Ager and Alison Pearce 2012-2013. Powered by Blogger.